Scotia was due to sail from Troon on 25 October 1902, but by the time all the stores and crew were aboard it was 2 November before she set sail. The expedition was going to slip quietly out of Troon but many people missed Sunday church to see Scotia depart for the Antarctic with bagpipes playing and the strains of Auld Lang Syne. Scotia sailed out of Troon past Lady Isle and with a sunset over Arran set course for Kingstown (now Dun Laoghaire), Dublin. Two of James Coats' yachts sailed in company to Dublin with a representative of the Prince of Monaco on board. Final supplies were loaded aboard - including a gift of two barrels of Guinness. Bruce had a chance to consult with Dublin scientists before Scotia sailed on 8 November. She left Kingstown with a piper playing, with gun salutes and amid a flotilla of small craft. Sailing south, the ocean swell and a head sea soon affected the crew. Dr John Pirie's diary on the 9 November said 'sick and miserable', and on 10 November 'very sick and very miserable'. On 19 November they sailed past Porto Santo and anchored off Funchal, Madeira on the following day. Ships fly the yellow international code flag Q (for quarantine) until the crew has been cleared to land by the port medical officer. When the officer cleared Bruce for landing he told them to take down the Q flag. "What quarantine flag?" asked Pirie - the yellow flag was the Scottish standard hanging limply from the main mast with only yellow showing. Scotia sailed from Madeira on 23 November after sampling of the wine, the sledge journeys down cobbled streets and the local fish market with its strange fish, much admired by zoologists. All these can still be seen in Madeira today. 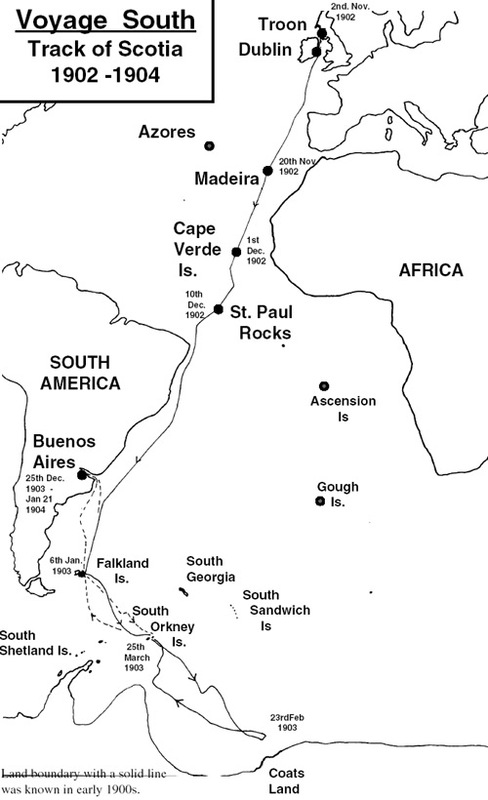 On 1 December Scotia stopped briefly at St Vincent, capital of the Cape Verde Islands, before setting course for Port Stanley in the Falkland Islands. On 10 December they stopped at the St Paul Rocks. These are found on the mid-Atlantic ridge 870km (540 miles) from the nearest land (Brazil). The rocks rise up to 18 metres (60 feet) at their highest point but the water round about falls to over 2,000 fathoms (3,650 metres or 12,000 feet). A ruined Portuguese lighthouse is on the rocks today. Bruce and his party had hoped to land but the swell was too strong. Pirie jumped ashore but fell into the sea. He managed to scramble back aboard as the crew fended off sharks with their oars. The rocks had been visited in the past by Darwin, James Clark Ross and the Challenger scientists. Scotia continued to sail south in the tropical heat for which she was not designed. Her course took her inside the island of Fernado Noronha, off the Brazilian coast at Pernambuco (called Recife today). 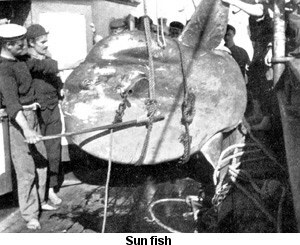 On New Year's Day the crew harpooned a sun fish which weighed three quarters of a ton. A plaster cast of this was given to the Science Museum in Edinburgh.